FahrentecTM’s prime business activity is manufacture and selling ice machines, taking value adding as our core principle has shaped us differently. FahrentecTM completely gives out its expertise and technology during any form of engagement with clients and associates. We let the clients to choose us, to make the decision. Right from the beginning of consulting, FahrentecTM takes close look at clients’ actual situation such like operating site area, power supply, temperature, and installation ability. Then carefully analyze all the best possible solution for clients’ needs. Revisions after proposals, one by one until finally reach the best design. Through efficient communication and professional manners, we help the client with getting full control, we let them understand what they are buying, and all detailed information is our responsibility to clients. Since the order is placed, FahrentecTM passes down the order acknowledgement to production in no delay, soon the production time-line is created and approved. Client can simply find out the machine construction progress at any stage from checking this time-line chart, FahrentecTM also take real time photos of machines to let client compare, the video of test running celebrates the birth of your tailor made ice machine. Thanks to the permanent and decent participation with large shipping companies, FahrentecTM utilizes all of its recourses and business connections to secure the Customs declaration and shipping while getting the best rate for clients’ interests. At the meanwhile, FahrentecTM send the spares and consumables in the package, as well as comprehensive user manual, installation instructions. We foresee the clients’ challenge, we sort them out before clients are confronting. 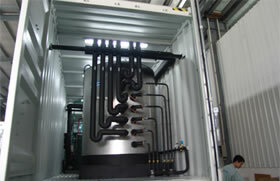 To deepen our discipline and faith in refrigeration industry, FahrentecTM also provides it expertise and technology to design and fabricate customized refrigeration systems. We start from targeting the customers’ needs, get it fulfilled with our handful available technology, human recourse, and the support of business associates. It is our attitude that we never turn the customers down, it is our responsibility to explore the customization because we see ourselves as the professional refrigeration people. 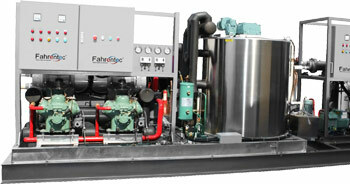 We welcome various thoughts, ideas of uncommon ice making solutions, in fact, FahrentecTM treats every individual case in the customization way, because we understand each project, machine, or system has its uniqueness and special requirements. Please feel free to let us know any type of ice making machine that you want to build with us, we are eager to give it a try! 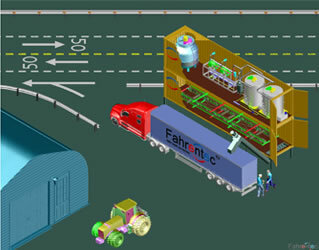 Turn-key ice making plant is the ultimate solution FahrentecTM presented in the recent years practice. Inspired from one simply but state- of- art concept, FahrentecTM developed the whole system available and reliable to materialize a plug and play for ice machine investors. In a standard turn-key ice machine plant, we design and consolidate four major modular, which can perfectly adopts with each other in whole, and also operate freely as individual. Along with the expansion of ice making business, client can always come back to get the extension modular for enhancement. Due to the heavily involved on site fabrication and installation, FahrentecTM usually sends out its professional team to instruct and assure the quality of whole system after installation. This team consists of our most well trained services engineers who have both the decent knowledge of ice machine and practical skills learned from onsite experience. This is the other exciting service FahrentecTM now is providing. Our specialized electric and program engineers can design and edit the system controlling program for almost any type of controlling demands. We utilize the latest designing concept, and technology to develop friendly operating, super intelligent, stable and safe controlling programs for you, the most exciting part is we also provide OEM service in this sector. Benefit from our skills and experience, you can have your products and systems upgraded to an competitive level. We guaranty you, not only for the refrigeration industry, we can make the program do anything you want, and it is nice looking and safe to use! More than 10 years discipline in program editing.